Navigation Pane is used for fast and easy navigation between different program views. It has a tree structure. If you click on a root element, you will see its description in the right pane. Getting Started: Here you can read a brief overview of WAPT Pro. Recorder: During the recording process all recorded requests are put to this folder. When you click the "Stop Rec" button on the toolbar, the sequence of pages is moved from "Recorder" to the user profile selected for recording. Profiles: This folder includes all user profiles of the current test scenario and the sequence of recorded pages. Scenario: Consists of several folders. Test Volume defines parameters of test run: the number of virtual users, test duration, date and time when the test will be started. 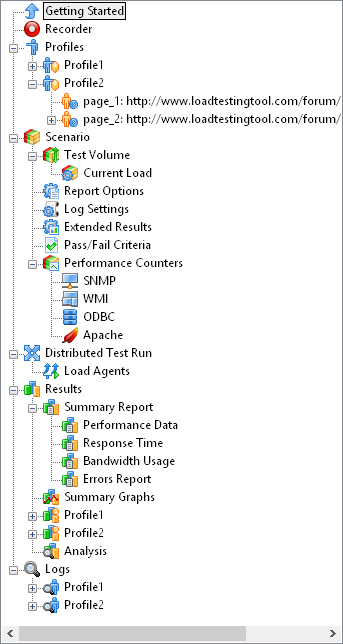 Current Load: This view appears when the test starts and disappears when the test finishes. Here you can change the initially defined load parameters just during the test, as well as used load agents (not interrupting the test). Report Options - general options for reports and graphs. Log Settings - options for log files. Extended Results - options for CSV data output. Pass/Fail Criteria - here you can specify the criteria of successful test execution. Performance Counters - here you can configure the program to collect performance counters statistics during test runs. Distributed Test Run: Use this view to specify the list of Load Agents that will emulate user activity and generate the test load during test runs. Results: This folder represents the results of test run in the form of Summary Report, Summary Graphs and graphs for all user profiles and individual pages. Logs: This folder represents logs (full or error logs) generated during test run. If you click on any item of the Navigation Pane, you will see its content in the right pane. You can right-click on items to see the context menu. You can change the order of requests in any profile: simply drag&drop pages in the Navigation Pane to form a desired sequence. You can also drag&drop pages between different profiles.